Use this rubric for students to determine how well they worked as a group. 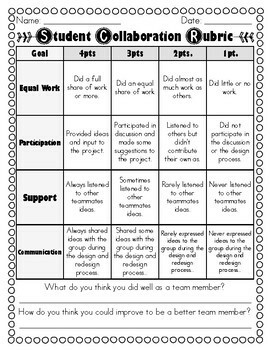 Using a collaboration rubric is a great way for students to help keep each other accountable during group work. If you choose to use this rubric be sure to review it prior to starting into the engineering design challenge so that students are clear on the expectations. This a generic rubric that can be used with any activity where students are working in a group! It pays to follow our store; all new products are 50% off for the first 48 hours! Just click the green star to follow and you will be the first to know when new products are posted.